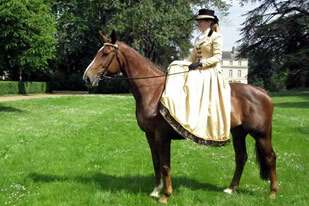 Side saddle riding may be traditional, but it is not old-fashioned. Every year new riders, young and older, take it up for different reasons. 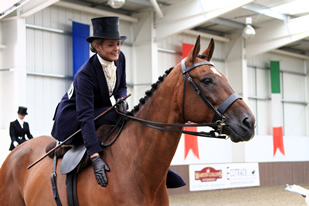 How do you ride Side Saddle? Firstly, you don't ride sideways. You actually sit absolutely straight and square in the saddle – from the back it should look the same is if you were astride. The saddle has two pommels sticking up at the front of the saddle. Your right leg goes around the top one, and then hangs down. Your left leg will be in the usual position, and with the second or lower pommel – the leaping head, curved over the top of your thigh, but not touching. Your left foot will be in a stirrup as usual. To replace your right leg aids you carry a stick on that side. 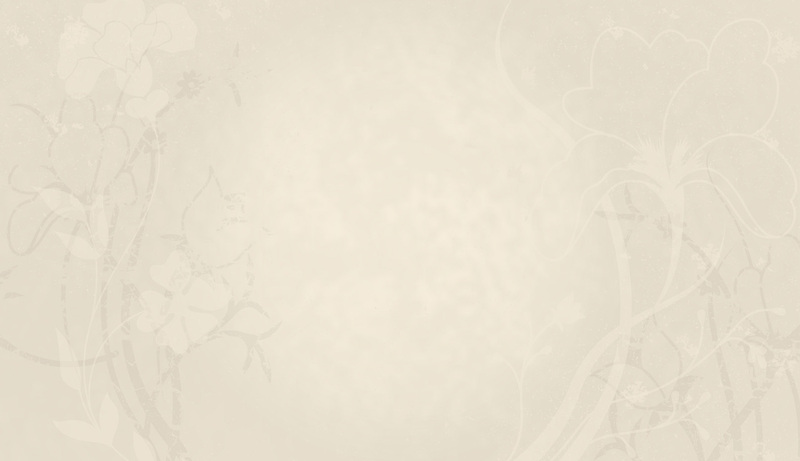 Most of the time, your right leg should be quite relaxed, and your left in the usual position. But, in times of dire need, you can use the pommels to create an emergency grip with both legs - clamp your legs together around the pommels and then it really is very difficult to fall off. 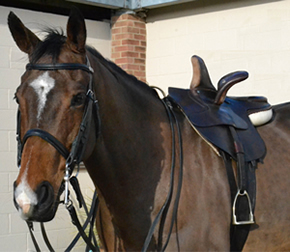 It does feel strange at first – you are quite a bit higher than in a normal saddle, and using very different muscles. You should not feel too uncomfortable though. If you do, is probably because the saddle does not fit you or the horse – or possibly both. To keep the ancient art alive and of course let's be honest, when done correctly, it looks fantastic. Additionally riding aside offers the rider with an ordinary horse a chance to compete at the highest levels. Most horses can be ridden side saddle. They do not need to be well-bred or particularly talented, but should be reasonably well schooled, and well mannered. It can often extend an older horse's competitive life. 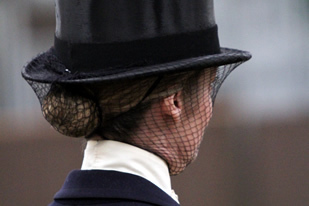 You can begin with your normal riding clothes, but if you want to compete or hunt, you will need a habit – a jacket with matching apron (the large piece of material that looks like a skirt, but is actually open backed, and covers your legs) - and the correct hat. Habits tend to be second-hand, but there are some excellent ready-made ones now available, and again they can sometimes be hired. You can also buy or hire some of the more theatrical and historical costumes – or maybe you know someone handy with a needle and thread?